Fill out our contact form and get ready to save on HVAC services! Heat Pumps are a great way to efficiently move air in your home. They can work as an alternative to your air conditioner, as a way to save on utility bills during times when the heat is not as intense. The heating and cooling technicians at Desert Air Conditioning Inc have the experience and know-how to help you make the best decision about your heating and cooling options, including adding a heat pump. During spring and fall and those wee hours of the night when the outside air is cool, heat pumps in Palm Springs can move hot air out of your home and cool air in, all while using 30%-40% less electricity. When you need to take the chill out of your home on cool days, a heat pump moves warmer air where you want it. After an inspection of your home or business, we can help you decide whether a heat pump installation in Palm Springs is advisable. There are many different kinds of heat pumps, each of which comes with different capabilities. Having a complete grasp of these options, our technician is happy to discuss the possibilities with you, and answer any questions you have. In addition to heating and cooling, a heat pump also works as a dehumidifier which may be important for some households. Depending on your needs, we have many options in heat pumps and our technicians can expertly install any size or style of heat pump for you. We offer the highest quality brands with the best warranties. When you are ready for a heat pump installation in Palm Springs, we’ve got you covered. As there are so many variations and types of heat pumps, it is important to have them maintained by an experienced technician. 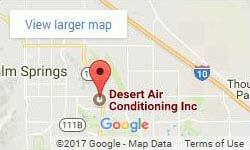 At Desert Air Conditioning we are able to work on any model or size unit you have. While heat pumps require minimal maintenance, keeping them clean and checking on worn parts will go a long way in elongating the life of your system. When you need heat pump repair in Palm Springs, we have the skilled technicians and the fully-loaded vehicles ready for the job. We do all we can to ensure you are not waiting for parts to be ordered. Our warehouse is full of as many parts as possible; so whatever you need, we have it. When you need us, we get to you quickly and get your heat pump up and running in no time. Heat pumps in Palm Springs can do double duty, working as an air conditioner as well as keeping your home low in humidity and even in temperature. As a high-efficiency way of heating and cooling your home, it is no wonder heat pumps in Palm Springs are ever more popular each year. Contact us today for your heat pumps in Palm Springs. Desert Air Conditioning enjoys working in Palm Springs as the city has so much to offer. With resorts galore, lush golf courses, a thriving downtown area, and cultural events going on all year, Palm Springs is a wonderful place to call home! © 2019 Desert Air Conditioning Inc. All Rights Reserved.